Then this may be the most important letter you'll ever read! You're About To Learn The Secrets To Overcome The Major Challenges That Come Along With Single Parenting, No Matter How Much Time You Have Had To Prepare! It doesn't matter if you've never experienced single parenting up close and personal, This guide will tell you everything you need to know, without spending too much brainpower! 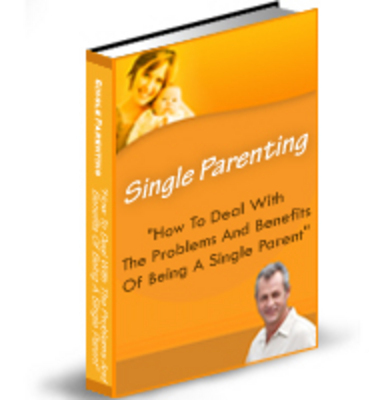 Are you planning on becoming a single parent right now or in the near future? If so, pay attention! There's finally a new, breakthrough book created just for people like you! And, if you really want to have the most successful, single parenting environment that will bring a smile to your face, then this book is definitely for YOU! I myself have been a single parenting counselor for 15 years, but it wasn't easy my first two times! I mean, information on this is pretty hard to come across. Especially the kind of information I wanted to know more about. To be quite honest with you, I got tired of looking and searching all over the place, so I decided to create the definitive book on single parenting! On Single Parenting You Can Find In Any Store..
...On the internet, or even at your local library for that matter! This book covers everything there is to know about single parenting . In fact, some people have called it the "Single Parenting Manual"! It's like having your very own parenting expert that you can reference and ask questions anytime that you need to! You're going to discover so many things on how to become a better single parent with little effort! Not only will you learn how to settle in as individuals and a new family, but you'll also learn extra bonus tips to actually teach people. * Discover what and whom single parents are as individuals and as a group. * Learn how to nurture close connections and bonds and the roles and responsibility that come along with single parenting. * How to solve behavioral problems and encourage confidence. * Discover all the different strategies for dealing with parenting difficulties and facing new situations and a unique set of 'operating' principles. * Learn how to make everyday count and make a difference. * Dicover the transitions of new circumstances and the journey down the path of single parenting. * Learn how to see things from the child's point of view. * Discover a new path and survival plan for single parents. * Discover the major challenges you need to overcome when you are a single parent. * Learn how to help children cope with the situation of your new role. * Discover how to battle the societal prejudice and stigma of single-parent homes and care giving. * Learn how to balance your new role of a single parent and your career. * Disocover how to break the old habits and get on with the new. * Plus much MUCH More! This new breakthrough book is a guide, really. A guide as a result of years of searching, studying, and scouring hundreds of websites, stores, and magazines. And this isn't one of those "Latin" books where you don't understand what's being said. Everything is in plain English, so you can put the Latin book away :) This easy to read single parenting book is completely comprehendible and won't take weeks to read. This Book In Less Than 90 Seconds From Now! That's right! No more waiting for the mailman to come to your door 7-10 days later.. You can start reading this book instantly! It doesn't matter if it's 2 AM in the morning, you'll be downloading and reading "Single Parenting 101" within just a few minutes. There's absolutely no risk to you - so what are you waiting for? Order now! Single Parenting - The Challenges and Rewards single parenting;single parents 93894254 14.00 valuebooks Fresh Download Available!